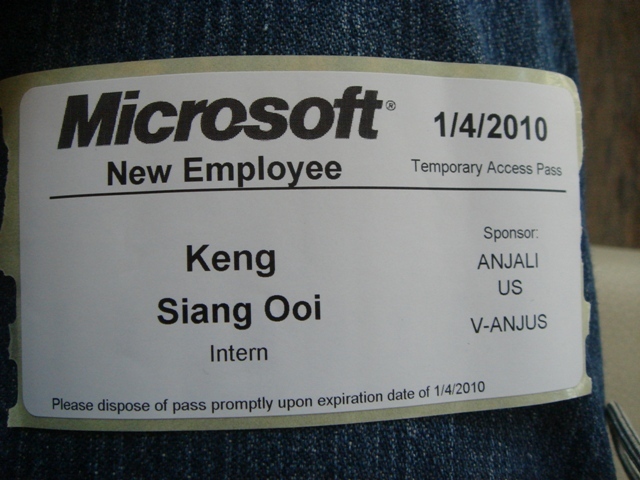 3 months past quickly and yesterday was my last day internship at Microsoft Research Lab India (MSRI). I wound said I gain a lot of experience at here from other researchers and having a lot of fun with people at MSRI. 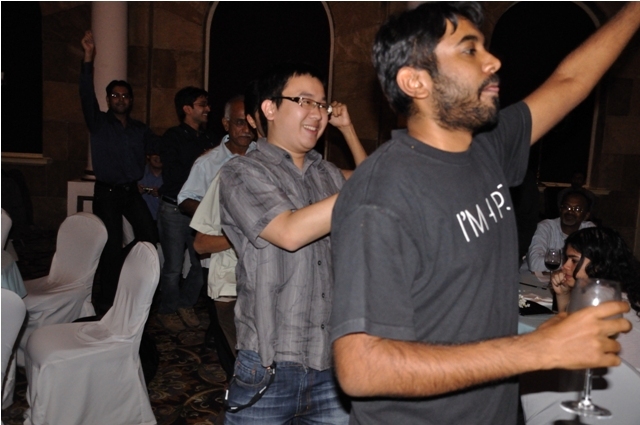 Everything begin at Imagine Cup 2009, where my team and I won the ticket in Design for Development Award and have the chances go to MSRI at Bangalore for internship. Aren’t it sound so cool to have the chances to intern at other country? I still remember the first day at MSRI where everyone whom visit the MSRI for the first week need to answer a question. The question is “If you have an hour or two to spend with someone, no matter living or dead. Who will be the one.” This is really something I never think of before. Well, I answered “I guess that will be my lover because I think no other people can listen to me boring talk for an hour or two.” and it work, some one came and told me that he like my answer. Shocking huh! While working at MSRI, I always start my day with some toasted bread with nutella and a cup of milk. 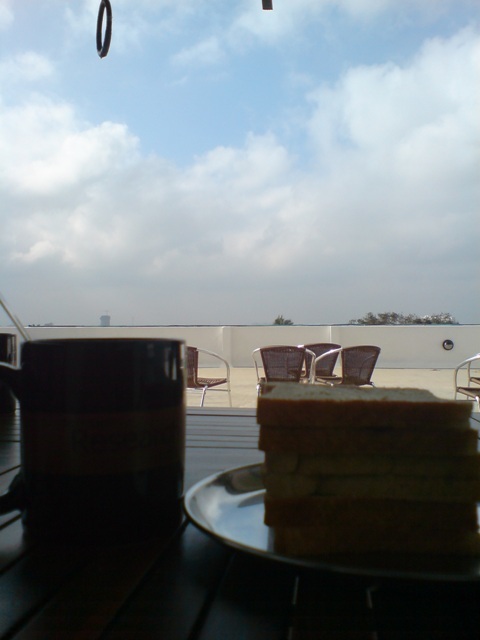 Having my breakfast on top of the roof with a nice view of the sky really is a great kick start of my day. I can’t believe that I have been using a machine with 2.0 GHz single core with 2GB RAM running Windows 7, Outlook 2010, Visual Studio Team Suit 2008, 2 Messengers, 3 Web Browsers, etc for the past 3 months. I sure give the machine a hard time, but I kind of get used to the speed later on. Well, it also give me a great reason to Facebook-ing when I compiling my code. The unlimited sugar and caffeine at pantry really keep me awake while working. I try to control myself for not taking it too much, else my weight sure will increase a lot. I really enjoy my internship at MSRI. The working environment are so nice, and the people there are friendly too. My happy boss Ed, who always has his happy smiling face. It seen like even the sky fall down, he can still smiling and get the problem solve. Saurabh, who is very friendly and always give us a lot of direction when to visit at Bangalore. 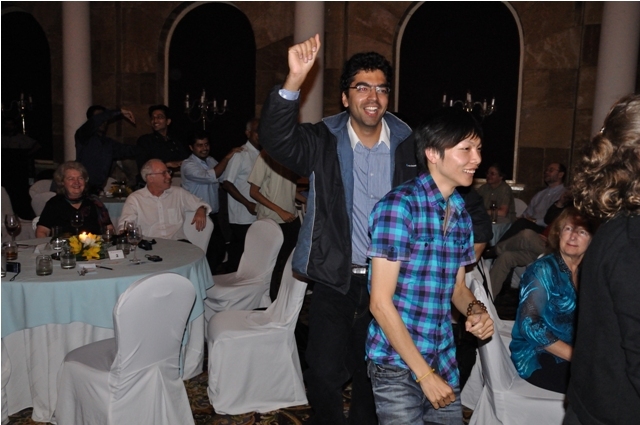 Some how he is keep on promoting IIT on us during our farewell dinner. Aishwarya, the researcher I’m working with. She surprise me as a non-IT background researcher yet know how to appreciate the work from programmer. I’m so glad to do the project with her. “How are you doing?”, this is always the question ask by David when he bump into me. He like to joke and make us laugh non-stop. He told me that study Phd is like eating a cake, full of fat in the end. I guess I will only understand it when I study Phd. My first impression on Bill, a very serious guy who don’t talk a lot. But in the end, I found out that he like to joke and tell some funny thing too. I think I know him a bit too late. I also learn some serious programming practice and .NET CE programming from Pushkar. Glad to working together with him too. Too bad that I doesn’t have much chances to know more about Indrani and Mimmi as they are too busy traveling around for their work. I also have a lot of fun with other intern there too. Aakar, Anand, Anuj, Diwakar, Gaurav, Kanika, Navkar, Olga, Praveen, Rebecca, Shashank, Vaishnavi, Varun, and Vishal. I guess I didn’t left anyone behind. The lab is so much fun with you guys and girls. We work hard and play hard there. I still remember the first time we play Frisbee together, where I hit my head on the tree truck when chasing the Frisbee. Ouch! Exploring Microsoft Surface together. Having lunch together and sharing our own story, about research, about future, about food, about place, about dog and etc. Lunch with Shaishav and Chinmay never get bored, because both of them sure make me laugh non-stop. Man, I going to miss you all. What I really learn in this internship? Good C# programming practice, Windows CE programming, .NET CE programming, using Visual Studio Team Suit, learned basic UI design for rural people, micro-finance, mobile banking and etc. In this internship, I also found that I’m still really weak in communicating, English speaking, reading research paper. I should really polish up my communication skill with others rather than just with computer only.